It's the last night. Your friends and family are gone, but you've got a ton of ammo and anger and zombies to kill! 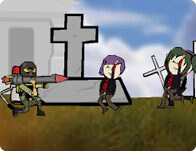 Move around the graveyard and blast those revolting zombies in the brain! Collect powerups, weapons, and cash to upgrade your stats and strength. Sweep and strafe to keep the zombies on one side, and don't get surrounded until you've killed thousands of the undead freaks! Use the WASD keys to move. Use the mouse to aim and shoot. SPACEBAR brings up the upgrade menu.